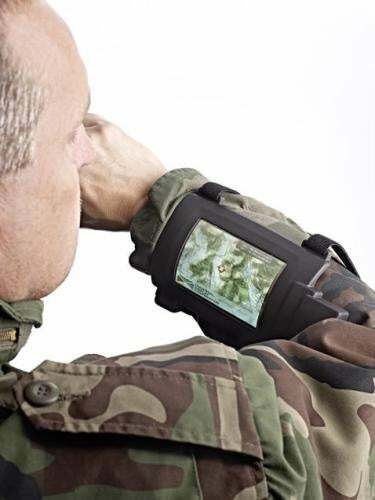 You can call the devices the U.S. Army is testing out at Fort Dix in New Jersey wrist mounted phosphorescent OLED Displays is you want. We're calling them PIPBoys. What the gentleman in the photo here is looking at is one of eight wrist mounted phosphorescent OLED Displays delivered to the U.S. Army for testing by Universal Display. The organic light emitting diode display is mounted on thin, flexible metal foil, which in turn is mounted on a wrist-wrapping housing to create a fully functional display and communication device. I would wear one of these 24 hours a day. My wrist would become a pale, sweaty mass of matted hair. That's probably not a good thing. It's just another fine example of PIPBoy technology in real life. All we need now is a devastating nuclear war, and in a couple of centuries we'll be playing Fallout for real!